The nip is back. In the air. So are cardigans and socks. People out in the streets still persist in wearing summer clothes. Like I do.And suddenly when a cold blast hits me, I shiver and so does the girl standing next to me. At the signal crossing. We both smile. And almost simultaneously we both sigh. Thinking about the fast approaching winter and the inevitable woolies. Then we go our separate ways. Each bemoaning the end of summer. So when the August Bank Holiday came up, we had big outdoor plans. It is the last public holiday here in the UK till Christmas. So almost everyone wants to make use of it. We decided on a picnic. Soon enough the all important question of food came up. Four families were going. Each of us decided to make a savoury and a sweet. For the sweet I decided to make cookies. Not just any cookies. 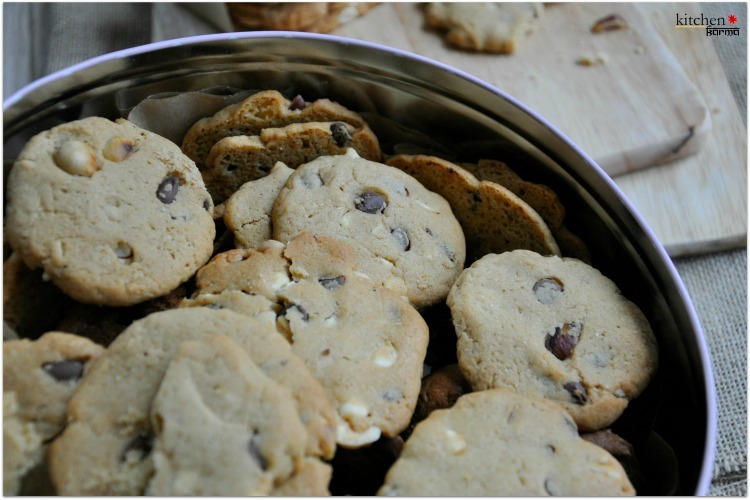 Chocolate chip ones loaded with hazelnuts. My favourite kind. And for the adults a fine sprinkling of sea salt to add a kick. And a surprise. The salty kind. It was an impulsive experiment. So I made a cautious small batch. But it turned out to be such a hit, I will have to make it again. Soon. These cookies are addictive. And the recipe really easy and adaptive. And forgiving. And now I can make them in a jiffy. Which worries my husband. Since he fears that now I will keep baking these goodies. And keep eating them. I tried to promise him that I will not. But it came out all half hearted. I just did not have it in me to promise not to bake chocolate chip cookies without a good reason like a celebration. For me the fact that I love these cookies is a good enough one to bake some. 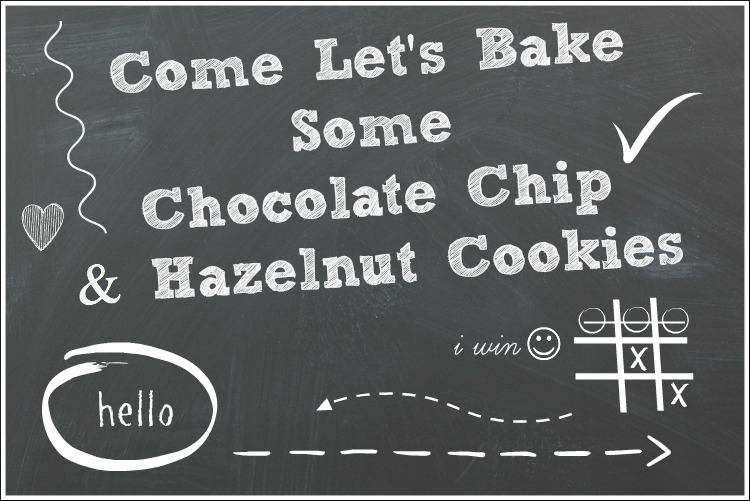 But before we go off to bake these treats, let's have a serious chat. Recently I went to the launch of the Lactofree Range. Now before the launch invitation I had no idea what lactose intolerance is. Now if you are like me I am sure you would appreciate some information. 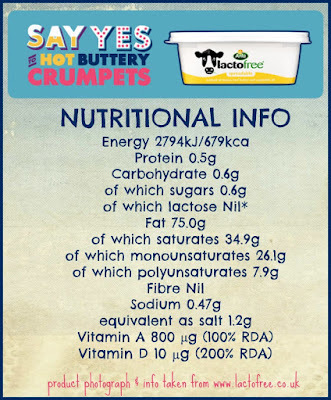 According to the Lactofree product guys-- In a normal digestive system all the food we eat is broken down into smaller and simpler 'bits and pieces'. This helps the body to absorb the food and take out the proteins and whatever is needed to maintain itself. Lactase breaks down milk sugar (lactose) into simpler form of sugar called glucose and galactose that can then be absorbed into the bloodstream. Lactose intolerance is the body's inability to produce enough of the enzyme, lactase, in the digestive tract. Without it, lactose (the natural sugar found in milk and other dairy products) cannot be digested properly, causing symptoms such as nausea, stomach cramps and bloating, after consuming dairy products. Lactofree is UK's only lactose-free dairy range, which allows you to enjoy the dairy you love with the uncomfortable side effects. At the event we were given some of the products from this range. 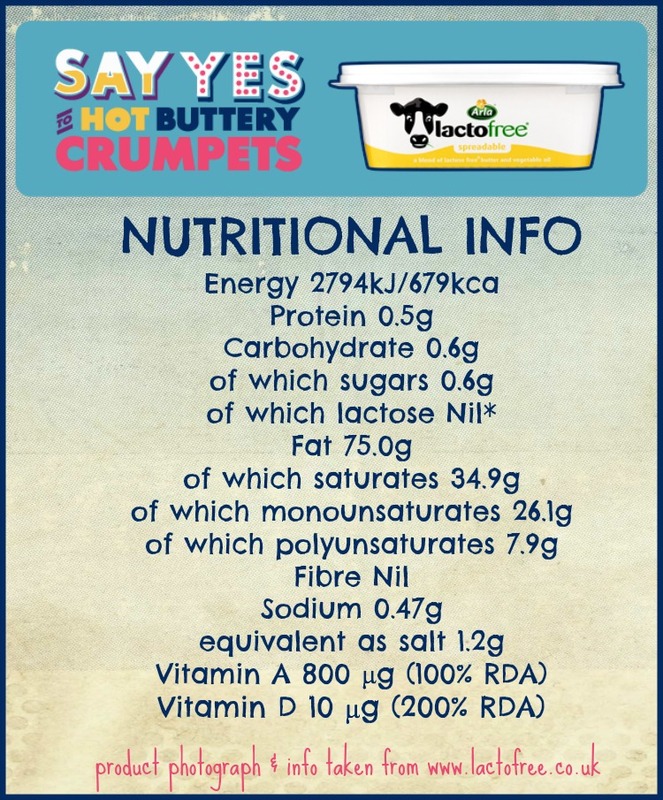 Among them was Lactofree spreadable, which is a blend of lactose free butter and vegetable oil. Now I was curious about this spread. It tasted just like any ordinary spread, if a little better. But I wanted to see if it bakes up as well. So I used this instead of plain ol' butter in the cookie batter. To my delight the cookies came out perfect and there was no way anyone could say that this was made with lactofree spread. I am very happy with this product. I am sure for those with lactose intolerance this product is great news. The chocolate chip & hazelnut cookie recipe is adapted from the Joy of Baking recipe, while the idea to put in granola came in from here. 1. Bring out the butter/spread from the refrigerator at least 2/3 hours before you plan to bake. 3. In an electric mixer add the butter and the milk and mix till smooth. 4. Slowly add both the kinds of sugar and the vanilla extract. 5. Add two eggs, one at a time. 6. Keep mixing till the whole mixture is smooth and creamy. 7. In another bowl sieve in the flour, the baking soda and the salt. Finally add the granola. 8. Add the flour mixture to the butter mixture and keep mixing. Repeat till the entire flour mixture is incorporated into the butter mixture. 9. Pour it into a big bowl and slowly add the chocolate chips and hazelnuts. Mix lightly. 10. Refrigerate the mixture for about an hour. 11. Preheat the over to 190 degree Celsius (375 degrees Fahrenheit). 12. On the baking tray take about two table spoons of the cookie dough and lightly press down with the back of the spoon. Leave space between the dough balls for the cookies to spread. 13. Bake these for 10 to 12 mins. Please keep an eye on your oven, if it gets too hot the cookies may brown too quickly. 14. This dough produces about roughy 40 cookies depending on the size you want. 15. On one batch I lightly sprinkled some coarse sea salt, these cookies came out really nice. 16. Once the cookies are done, cool them completely on a wire rack before serving. I have read that these cookies stay in an air tight tin for 4/5 days. But my batch was distributed among friends who merrily chomped them off the very same day. So I will not be able to verify this fact. If you are wary about baking such a large batch unless you have plans to distribute them quickly (I would totally be) I am sure this recipe could be halved as well. So go on give yourself a mid week treat and do let me know how it went. I also feel like winter is coming soon, although I keep on wearing summer clothes. 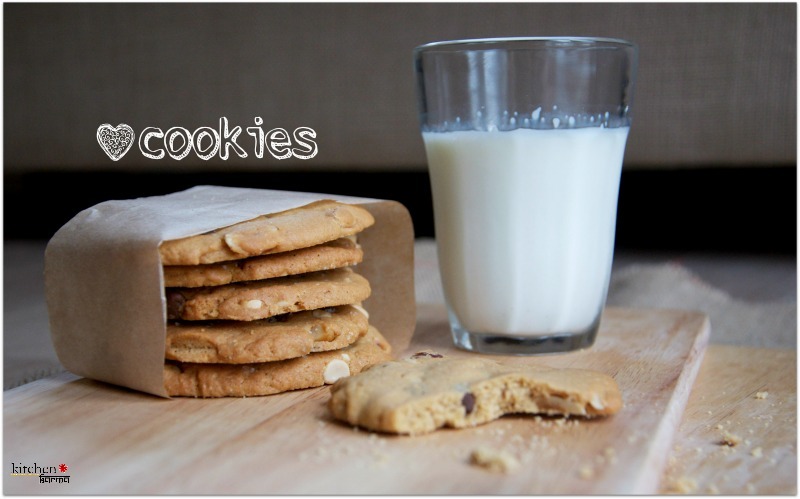 Cookies look so delicious and crunchy. Great pics of summer. Suchi , ugh ! In this side of the world , it is still hot though it has been raining steadily for couple of days *sigh* Winter is still a month away here , I think :P I can't drink milk in the morning or else I'll be staying the whole day in the loo but if it is coffee with milk I'm fine . Weird , right ? So , how was those cookies with sea salt ? You like it ? My side of the world is also getting cold, this would just perfect way to warm the pre winter times...oh i love the picture with recipe written on its cozy! Can have a couple right away, looks too good.. The cookies look so good. Perfect with that glass of milk. Gorgeous cookies! They must must be divine. I love hazelnuts. Awesome beautiful cookies.. :) Perfect clicks.. Happy to be your 200th follower! :) Thanks for dropping into my space n leaving behind good comments! My mouths watering like crazy! Love the pictures! Like that cute little kite. 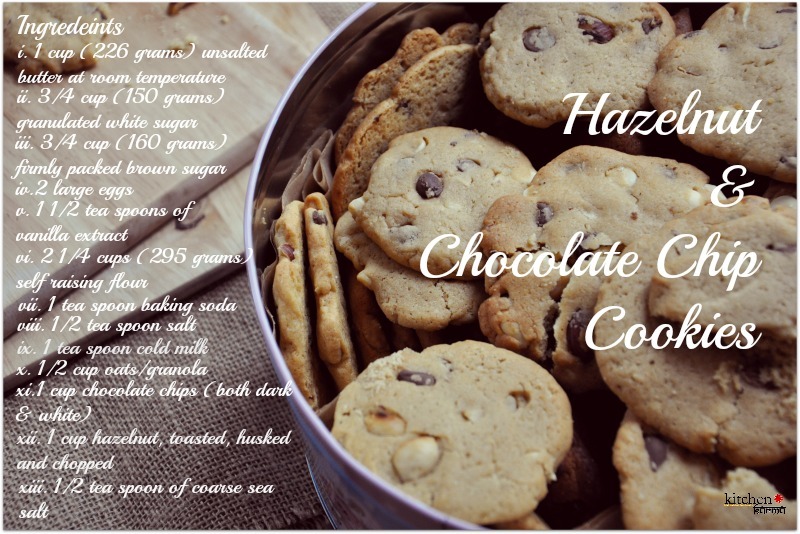 sum thing different n unigue look in ur blog..nice..n very tempting cookies.